The picture below shows how the Micro:bit is set up, This time it uses the radio module to light up an neo-pixel on another Micro:bit, after one of the buttons is pressed. 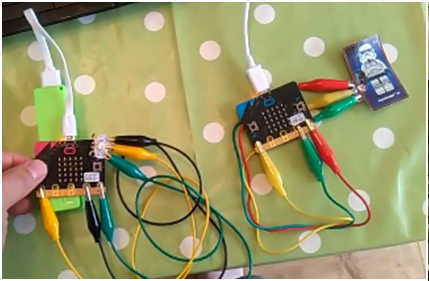 You will need to code the Micro:bit with MU either on a PC/ MAC or Linux machine. At the time of writing the BBC website will not allow the radio module to work. This program uses the radio on the Micro:bit to send messages to trigger neo-pixels on other Micro:bits. The radio code here is taken from the demo by N Toll on the Micro:bit read the docs website. You will need at least two Micro:bits in order to see it working, both Micro:bits will need the same code loaded onto each one. # Button A sends a "flash" message. # Read any incoming messages.